The Arizona Corporation Commission (ACC) has authority over the transmission siting process in the state of Arizona. In Arizona a public service corporation must obtain a Certificate of Convenience and Necessity prior to constructing a transmission project. ARS 40-281. A “public service corporation” is defined, in part, as “all corporations other than municipal engaged in furnishing…electricity for light, fuel or power…” Arizona Const. Art. 15, Sec.2. Specifically, bulk transmission providers will fall under the class of public service corporations deemed “electric service providers.” An electric service provider is a “company supplying, marketing, or brokering at retail any Competitive Services pursuant to a Certificate of Convenience and Necessity.” AAC R14-2-1601(15). In SWTC v. Arizona Corp. Comn, 142 P3d 1240 (2006) the Arizona Court of Appeals found that a wholesale transmission provider is still a public service corporation subject to regulation and CCN requirements. 8-AZ-c.1 to 8-AZ-c.2 – Is the Developer a Public Service Corporation? All developers meeting definition of a public service corporation and planning to construct a transmission project that will service ender users in Arizona must submit an application for a Certificate of Convenience and Necessity (CCN) to the ACC. AAC R14-2-1603(A). If the developer is a corporation, the developer must submit a certified copy of its Articles of Incorporation with the ACC before the ACC will issue the CCN. ARS 40-282. Such other information as the ACC or the staff may request. The developer must report in a timely manner during the application process any changes in the information initially reported to the Arizona Corporation Commission in the application. AAC R14-2-1603(C). For further information and specific application submission requirements see the Arizona Corporation Commission Application for a Certificate of Convenience and Necessity for Competitive Retail Electricity Services on the Arizona Corporation Commission Applications and Forms webpage. The developer must provide public notice of the application as required by the ACC. AAC R14-2-1603(D). 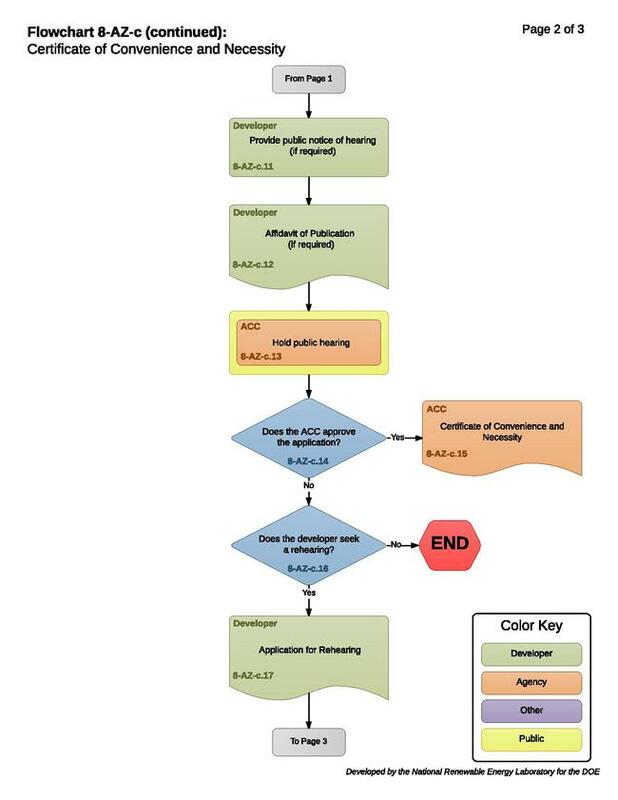 The ACC must review the application and notify the developer in writing that the application is either administratively complete or deficient within 120 days. If the application is deficient, the notice specifies the deficiencies. The developer has 60 days to remedy any and all deficiencies. If the developer does not remedy the deficiencies within 60 days, the ACC may terminate the application. 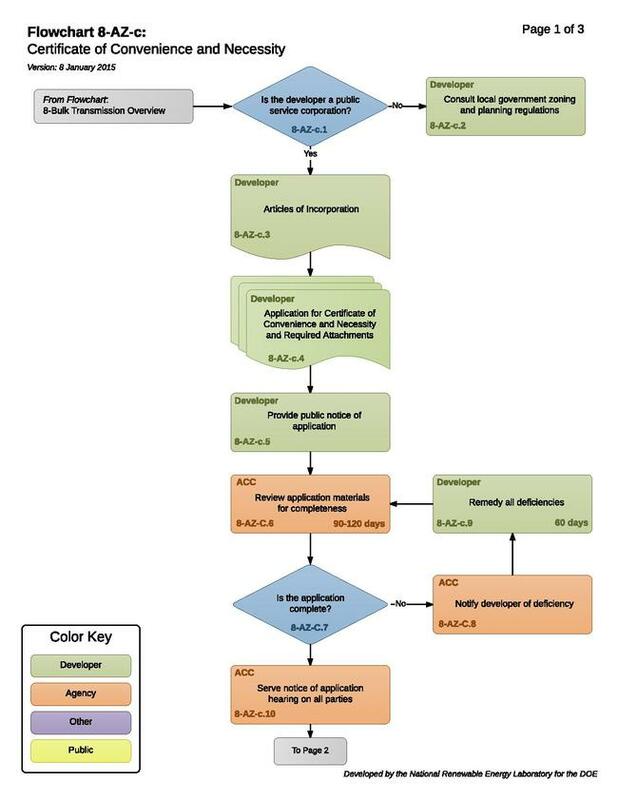 If the developer does remedy the deficiencies within 60 days, the ACC has 90 days to notify the developer whether the corrected application is administratively complete or deficient. The developer’s CCN application will be reviewed at a hearing. The ACC will serve notice of the place, date and time of the hearing on all parties at least 10 days prior to the hearing. AAC R14-3-109(A). If required, the developer must provide public notice of the hearings and file an Affidavit of Publication with the ACC at or prior to the time of the hearing. AAC R14-3-109(B). The ACC holds a hearing on the application for CCN. AAC R14-3-109(A). The developer, the ACC, and all other parties to the hearing will be permitted to introduce evidence, present testimony and call witnesses. AAC R14-3-109(G). The hearing will be open to the public. AAC R14-3-109(V). 8-AZ-c.14 to 8-AZ-c.15 – Does the ACC Approve the Application? Seeks certification as a Load-Serving Entity and fails to submit an executed Service Acquisition Agreement with a Utility Distribution Company or a Scheduling Coordinator for approval by the Director, Utilities Division, prior to the offering of service to potential customers. Agreements are to be filed with the Compliance Section, Utilities Division. Must comply with all disclosure requirements pursuant to AAC R14-2-1617. 8-AZ-c.16 to 8-AZ-c.17– Does the Developer Seek a Rehearing? If the ACC denies the developer’s CCN, the developer may seek a rehearing before the ACC. If the developer seeks a rehearing, it must file an application for rehearing with the ACC within 20 days of the final order of the ACC. ARS 40-253(A). The application must set forth the grounds on which the request for rehearing is based, and the ACC will not rely on any ground not set forth in the application. ARS 40-253(C). The developer will not have a claim for judicial review in any court unless the developer first applies for a rehearing with the ACC. ARS 40-253(B). 8-AZ-c.18 to 8-AZ-c.19 – Does the ACC Grant the Rehearing? The ACC determines whether to grant or deny the application for rehearing. If the ACC does not grant or act on the developer’s application for rehearing within 20 days of its filing, the application is denied. ARS 40-253(A). If the ACC grants the application, the ACC must promptly hear the matter and make a determination within 20 days after final submission. ARS 40-253(A). When the ACC grants the rehearing it will consider all pertinent facts (including those arising since the prior ACC order) to determine whether any aspect of its original order is unjust, unwarranted, or should be changed. ARS 40-253(E). If the ACC denies the developer’s application for rehearing, the developer may pursue judicial review in the Superior Court. ARS 40-254(A). 8-AZ-c.20 to 8-AZ-c.21 – Does the ACC Approve the Application upon Rehearing? If the ACC rules in favor of the developer on rehearing, the ACC grants the CCN to the developer. If the ACC rules against the developer on rehearing, the developer may seek judicial review in the Superior Court. ARS 40-254(A). Jurisdiction over the denial of a CCN application lies in the Superior Court of the county in which the ACC has its office. The developer must file a notice of appeal within 30 days after the denial of a rehearing by the ACC or within 30 days of being served with a copy of the ACC decision to be reviewed. ARS 40-254(A). The notice must contain a statement of the findings to be reviewed. ARS 12-909(A). The developer must serve the notice of appeal on the ACC and all other parties within 10 days of the developer’s filing of the notice of appeal. ARS 12-904. The ACC must file an answer to the complaint within 20 days of receiving notice. ARS 40-254(A). If the ACC rescinds the CCN denial, the case is dismissed. ARS 40-254(B). 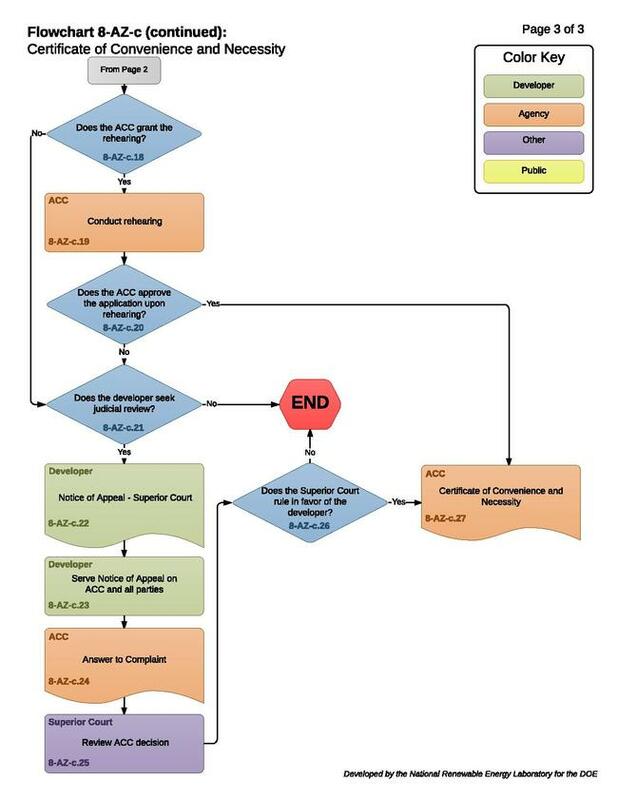 If the ACC modifies or amends the order, the altered, modified or amended order replaces the original order complained of for purposes of the judicial review. ARS 40-254(B). The Superior Court holds an evidentiary hearing, including testimony and argument. The court may hear testimony from witnesses, whether or not they testified at the ACC hearing. ARS 12-910(A). The burden of proof is on the developer to show by clear and satisfactory evidence that the decision to deny the CCN is unreasonable or unlawful. ARS 40-254(E). If the Superior Court rules in favor of the developer, the ACC will grant the CCN. If the Superior Court rules against the developer, the project cannot continue. In either instance the ACC, the developer, or the state Attorney General may appeal the decision to the Arizona Supreme Court within 30 days of the Superior Court judgment. ARS 40-254(D). This page was last modified on 29 January 2018, at 11:41.